Bryan is rockin' that suit! Our Tour was over but the party was just getting started! On Sunday night, The Pink Lightning Team attended the 25th Annual Courage Classic Gala, recognizing the riders and teams that participated in the 2014 Classic. The event was held at the base of Copper Mountain on a night where raindrops and accolades showered down upon the participants. After a brief happy hour of cocktails and hors 'd oeuvres, the Children's Hospital Colorado Foundation staff began the festivities by recognizing the top 5 teams and the top 5 riders based on overall donations. Bryan was last year's top rider after raising more than $74,000—earning the #1 Bike flag for this year's Classic. But he nearly QUADRUPLED that number with over $273,000 as of today's date. This year's number ONE as well. Simply amazing! Bryan's father Steve, stepped to the podium and spoke about the Pink Lightning Team. He then told the audience about Bryan's story and the particular health struggles that he has endured in 2014. After speaking about Bryan's dream of being the person with cystic fibrosis to compete in the Olympics (as a hockey goalie), he introduced the man himself. Bryan stepped to the podium and graciously acknowledged the members of the team—especially the support and love he has received from his parents, his brother Jake and girlfriend Madi—and then thanked all of the other riders and support staff that has made his 2014 Courage Tour of Colorado a resounding success. After a wonderful ovation from the crowd, Bryan relaxed with his Team, family and friends. There was a rumor floating around that he later snuck out of the Gala with Madi—and had a romantic dinner in Copper Mountain village. Since no photos have surfaced to confirm this, it at this time remains only a rumor. So this is the end of the line....for now. Bryan is already attending hockey camps and practices as he prepares for the 2014-2015 hockey season. Stay tuned as we will update this blog as to his progress...making his next dream come true. Video of the Finish Line at The Courage Classic! To read about the Bryan's journey, go here. Mike is actually in the lead? The photographer better watch out! Steve wants to ride more! Bryan is certainly #1 today! Next dream on the list? 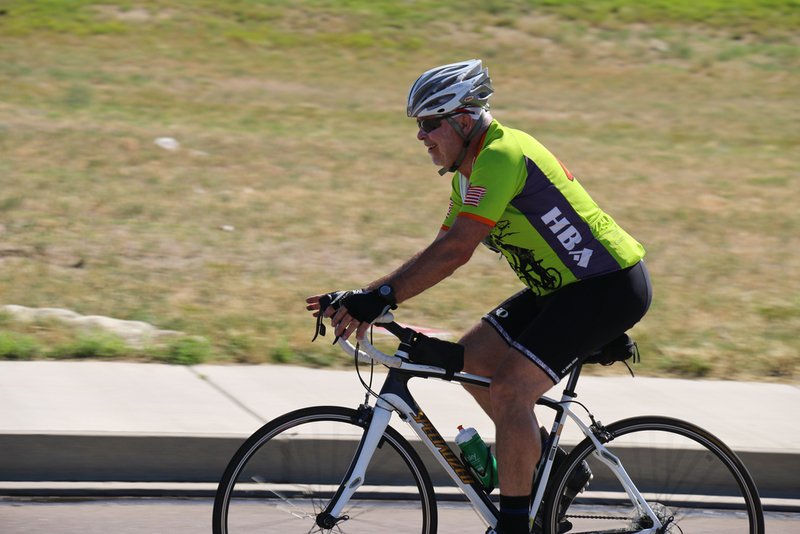 Our final ride of the Courage Tour of Colorado was on Saturday, July 19. We had planned this ride to not only coincide with the 25th Annual Courage Classic—benefitting Children's Hospital Colorado—but to ride across that finish line on Day 1 as the top fundraiser for 2014. Happily, we accomplished that goal for the second year in a row! The day started in Dillion as we gathered the Team for the easy 12 mile route to Copper Mountain. We were joined by many riders that had rode with us on previous rides, and they have truly become "family" to us by their continuing outpouring of love and support. Speaking of family, we were joined by the Whitson Family—Greg, Susie, and sons Ethan & Reed. 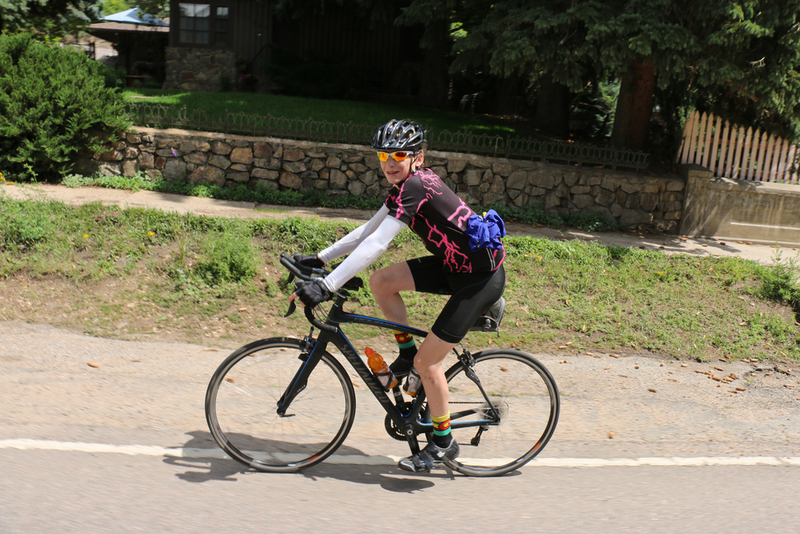 This was Ethan's second ride for us, as he also rode on Day 3, Longmont to Ft. Collins. We were glad to have him back with us on this special day. Once we were assembled and ready, we hit the Summit County Bike Trail to Silverthorne, past Lake Dillion and on into Frisco. It was another spectacular, sunny day in the mountains—so the riding was not only easy, but a lot of fun as well. Just outside Copper Mountain, we came across several more members of the Pink Lightning Team. They had been around the various routes of the Courage Classic and rode up to show support and ride across the finish line en masse. Like the thousands of other CC riders, we rode into Copper Mountain Village amid the sound of cow bells. music, the encouragement of the volunteers and the roar of the crowd. We crossed the finish line—with Bryan and his father Steve, leading the team. It was a magical moment. We had done it! 1,056 miles around the state of Colorado in 43 days. The emotions ran high as Bryan was congratulated by his family and friends. The team was in great spirits and congregated with other riders and teams that make the Courage Classic such a special event. There are a thousand stories among the participants and all of them are special in their own way. In fact, we had a special story amongst the team—and it wasn't just Bryan this time. Steve Roy—a dear friend and an avid cyclist—who had ridden several legs with us previously, brought his 12 year old son Christian, along for the ride. Before our ride that morning, Steve and Christian went from Copper to Vail and then back to Copper over Vail Pass. What made this amazing is it was Christian's first time on a road bike! What an accomplishment for this future Pro Cyclist! The team celebrated Bryan's successes and had a great time among the festivites. There was a tinge of sadness though, now that the Courage Tour of Colorado was over. But a new challenge is on the horizon for Bryan. His aunt Nancy presented him with a USA Olympic Hockey jersey, sparking his dream to be the first person with cystic fibrosis to compete in the Olympics. With hockey season right around the corner, Bryan will trade in his wheels for skates—and defend his title as the best goalie in the state of Colorado for his age. Go, Bryan Go! His dream of riding around the state has come true. May the next dream come true as well. Congratulations, Bryan! You earned this. ...wait a minute...that's NOT Bryan, it's Madi! After ringing the opening bell, he was greeted by many members of the Children's Hospital Colorado Foundation, the group that creates and oversees the Courage Classic each year. He also met another special child, Lily Winsett, the wonderful daughter of Steve Winesett, President and CEO of the Children's Foundation. Lily was excited and ready to ride! Back at HQ, Madi, Bryan's girlfriend, decided to dress up as "Bryan" and surprise him with a characterization of himself. He cracked up at the sight, and she hammed it up for good measure. Spirits were high as we prepared for the final ride from Dillion to the Courage Classic finish line on Saturday. ...while Bryan is all "Monkey Business". Well it had to happen. After all, this IS Colorado and there is a saying here if you don't like the weather, wait 15 minutes. It is sure to change. After 5 weeks of nearly perfect weather on all of our rides, we got that change...big time. 'Twas a cloudy, cold and rainy day—on one of our toughest rides no less. Up and over Loveland Pass. The day started well at the Georgetown Visitors Center, as we unloaded and got ready for the ascent. This ride was a Category 1 climb so we made sure we had plenty of liquids and snacks "on board". And since we could see the clouds forming, we packed in our rain gear as well. 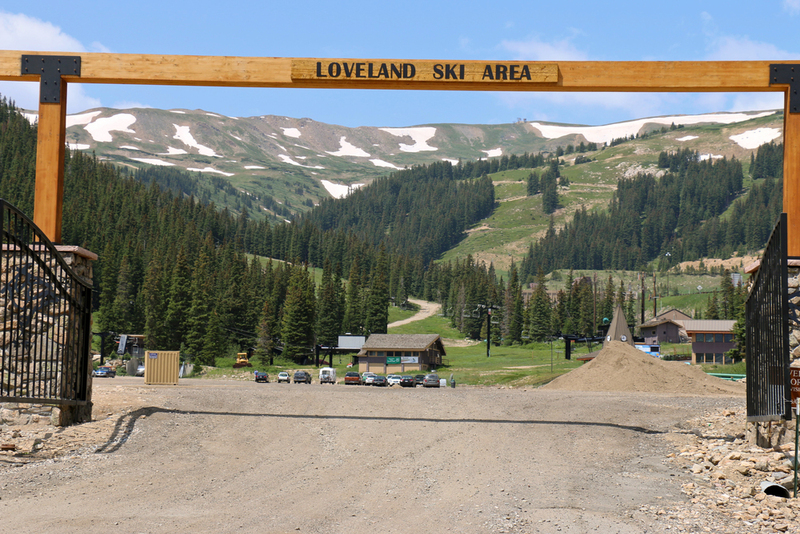 We got to Loveland Ski area within minutes. Bryan was feeling so good that he stopped, dismounted and started horsing around with his girlfriend Madi, who was in the Team vehicle with her mom Yvette, and his mom Wendy. Steve gently guided him back on the bike and up the pass they went—getting colder and wetter as they climbed. The top was beautiful, way above timberline at 11,991 feet above sea level. But our stay was brief as the clouds were getting darker. 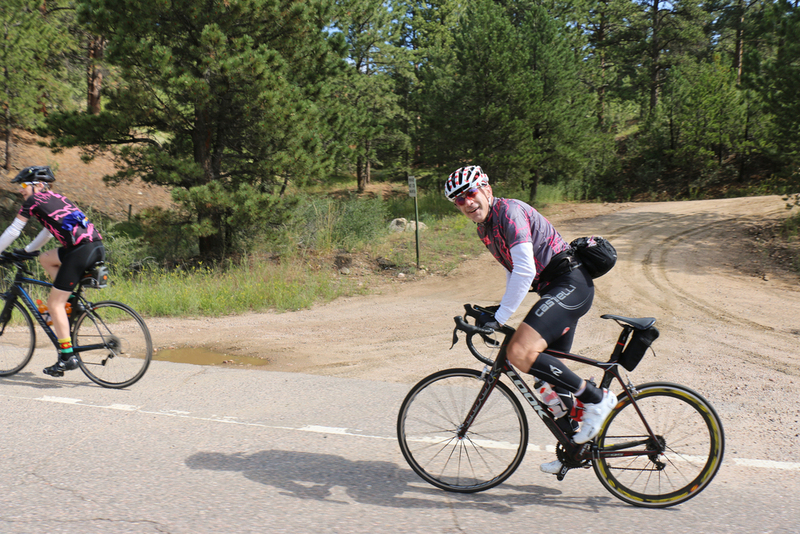 As we were ready to descend, we met a fellow cyclist—Joel Diffendaffer of Kansas City. We all went down together, and Joel showed he was not a "flatlander" as he is an expert cyclist. It was an exhilarating descent, flying past A-Basin and Keystone. 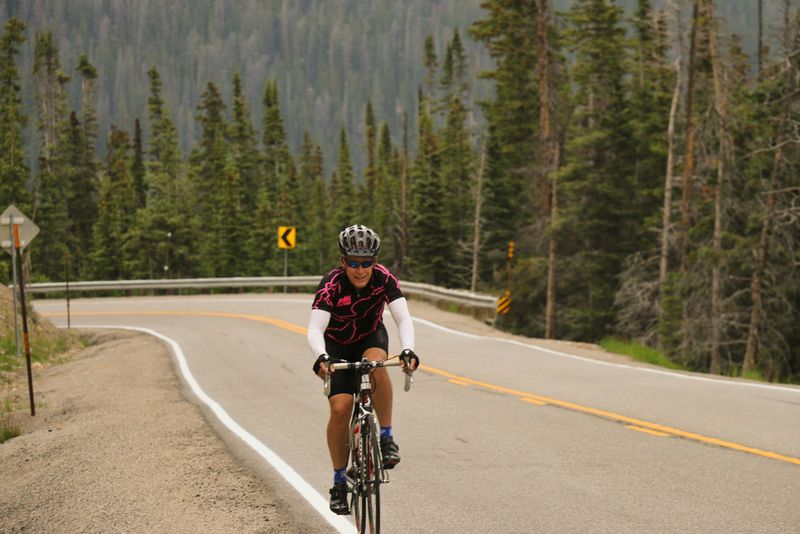 The sun came out, which warmed and dried the three riders as they rode along the shores of Lake Dillion and ended the 34.23 mile ride in Silverthorne. Steve and Bryan said their good-byes to Joel and loaded up the PL Yukon and we headed to Copper Mountain. We thank you for your support and will post the grand finale tomorrow! A great state of fun! What a great group! Thanks for riding with us! Ride 19 was our final "two-fer"—with two rides that went from Evergreen to Georgetown. 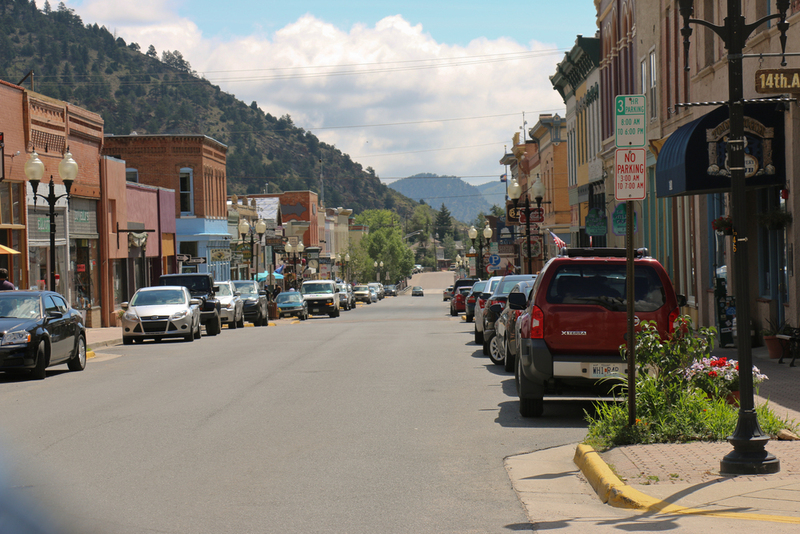 The first leg was 9.67 miles from Genesee Park in Evergreen to Idaho Springs. Like all of our rides during the Courage Tour, we had great weather and wonderful friends to ride with us. 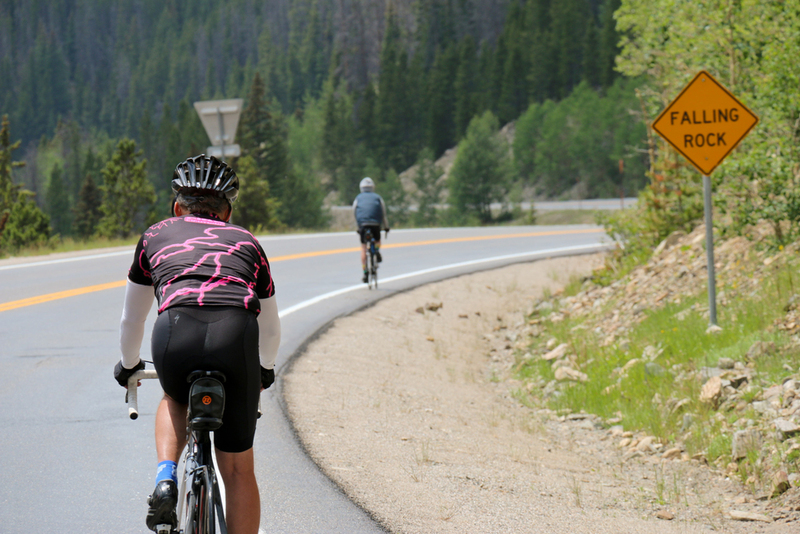 We also had the great fortune to have a newly paved US-40 to ride on from Evergreen to Idaho Springs. Smooth sailing...er....riding! After our break next to Clear Creek and the historic Argo Mine, we then rode 12.06 miles from Idaho Springs on US-6 along Clear Creek, ending up next to Georgetown Lake. The shimmering lake had it's share of anglers, hoping for the catch of the day. After a brief break, and a warm goodbye, Jim departed. 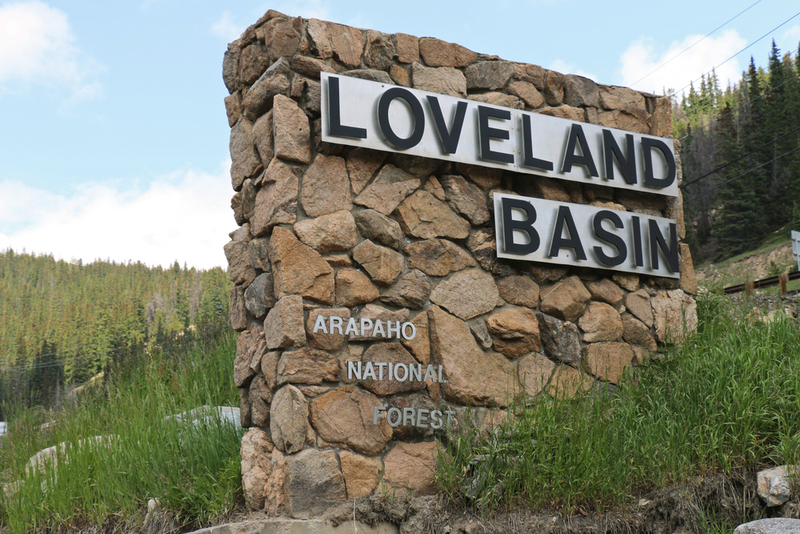 He headed back down the road to Evergreen while the rest of the Team commuted and had lunch. Another great ride with great friends and now a fond memory—in a tour chock full of them. We're in the Rocky Mountains. What kind of Oysters? Ride 18 had the three core members of the Pink Lightning Team riding from Children's Hospital South Campus in Littleton to Evergreen. These three, Chris Callow, Steve Warnecke and Bryan Warnecke have put in more miles than any other riders that have joined the Courage Tour of Colorado. In fact, they decided early on that this ride was going to be an "Out-and-Back" and not just one-way to Evergreen as planned. 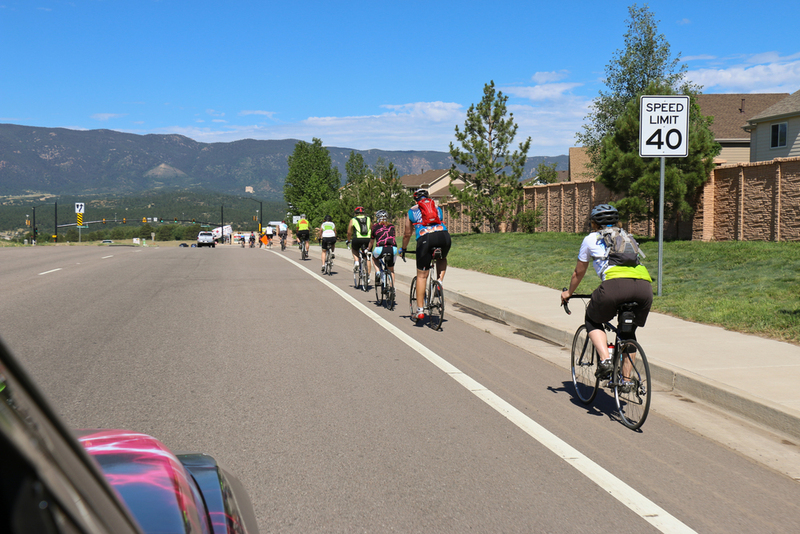 After assembling at Children's Hospital South, the Team rode along the C-470 path to Morrison and then up Bear Creek Road through Idledale and Kittredge. After a brief stop at BeauJo's parking lot in Evergreen, Chris, Steve and Bryan turned around and headed back down Bear Creek Canyon—which was the reward for the morning climb. The Team rode all the way back to Children's and then rode back to their nearby homes for a total of 54 miles. Meanwhile, the support team stayed in Evergreen and had a delicious creekside lunch at Cactus Jack's before driving down. It's tough work being the crew, but somebody has to do it. The team hits the final legs Thursday, Friday and Saturday—ending with a triumphant crossing of the finish line at the Courage Classic. Come up to Copper Mountain and be part of the fun! This ride was in our own backyard! We left our home base in Castle Rock bound for a 23.5 miles to Children's Hospital South campus. Since this is one of our daily training rides, we rode to the hospital, turned around and rode back. Not every leg of the Courage Tour is glamorous, but the miles do add up. Getting ready for the Courage Classic next weekend! Matt's Ride Team...ready to go! Thank you Pro Cycling for your support! Team Endorfin is here too! 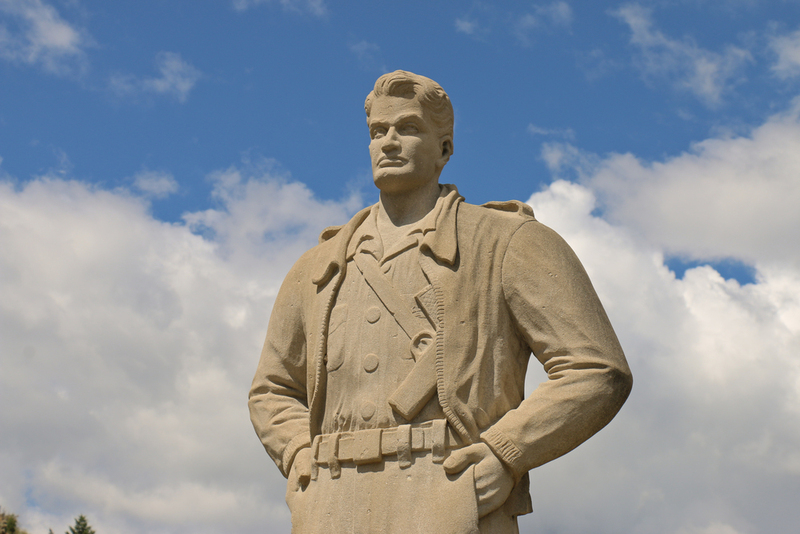 Mike Rasser—off the back already? Robin Rasser looking good. Where's hubby? Ride 16 was a fantastic ride from Children's Hospital at Briargate in Colorado Springs to our home base of Castle Rock. 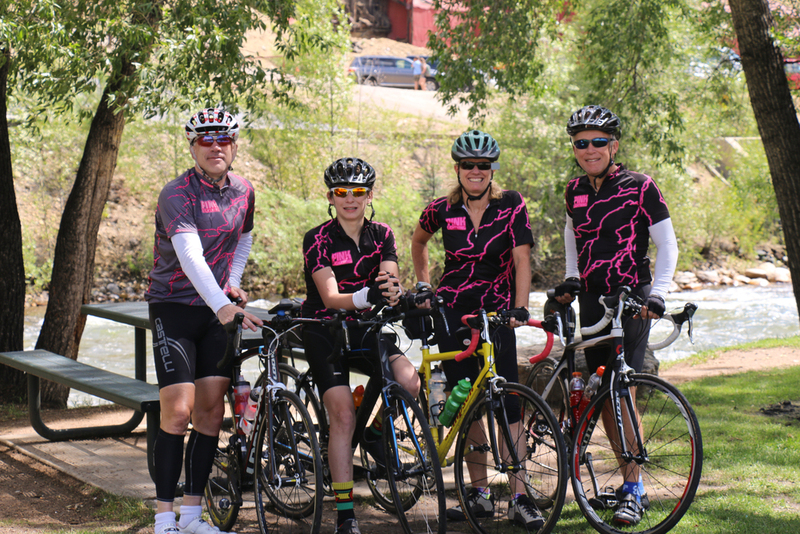 What made the day so special were not only the 26 riders that joined Team Pink Lightning to ride, but the wonderful Children’s Hospital Colorado Outpatient Specialty Care Center staff as well. The ride started with everyone gathering at the Outpatient Specialty Care Center for breakfast, generously sponsored by our friends at Salsa Brava. The food was delicious and got the riders "fueled up" for the 47 mile route. In addition, riders could get their bikes tuned up on premise with a bike tech from Pro Cycling. Thank you for your generosity in celebration of Courage Classic’s Team Pink Lightning’s stop in Colorado Springs. After breakfast, Greg Raymond, Regional Vice President at Children's Hospital Colorado, thanked the crowd for their support—Children's Hospital at Briargate has big plans for Colorado Springs! Then Steve Warnecke, Bryan's dad, spoke to the assembled riders and introduced 13 year old Noah, a 2014 patient ambassador for Children's Hospital Colorado. Noah was born with a congenital heart defect called pulmonary venous return above the diaphragm. Doctors punctured a hole in his heart for a temporary fix, and eventually did open heart surgery to permanently repair his defect. Noah is now healthy and participating with his family in the Courage Classic. He also is a great kid, with a terrific smile. Thanks for being a part of the day Noah! After a few last minute instructions from Steve, the riders took a formal picture and saddled up. One special rider along for the day was Samantha (Sammie) Heinrich, a Cat 1 Road Cyclist, C5 Para-Cyclist and current member of the U.S. Paralympic Cycling Team. Sammie was a welcome addition to pace the team along with Bryan. On the bikes and down the hill called Briargate Avenue! 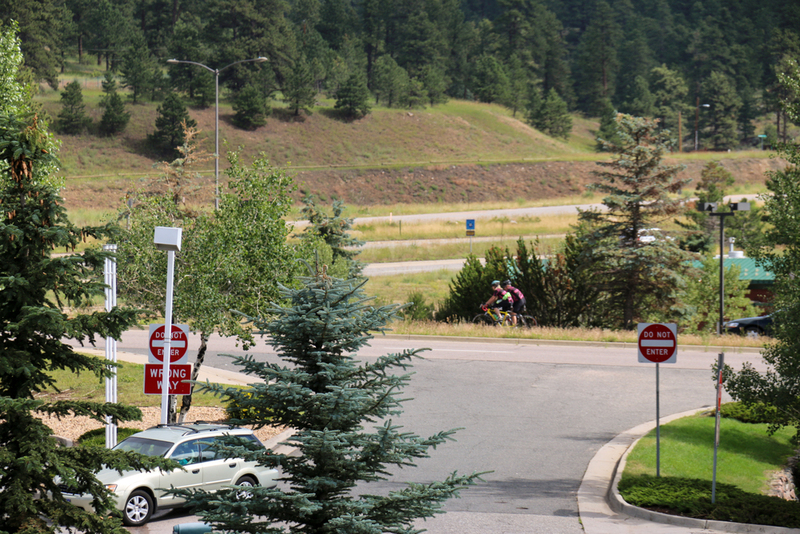 The route took the Team past the Air Force Academy, up the Old Denver Road and into downtown Monument. It was here where the Team took a break—as some riders could do an "out-and-back"—to return to their cars. After some food and hydration, the remaining riders took off towards Palmer Lake on CO-105, otherwise known as Perry Park Road. The "Sag Wagon" (SG) and Bryan's main support team, mom Wendy, girlfriend Madi and aunt Nancy, decided that the Monument Farmer's Market was in need of more attendees. Shopping! 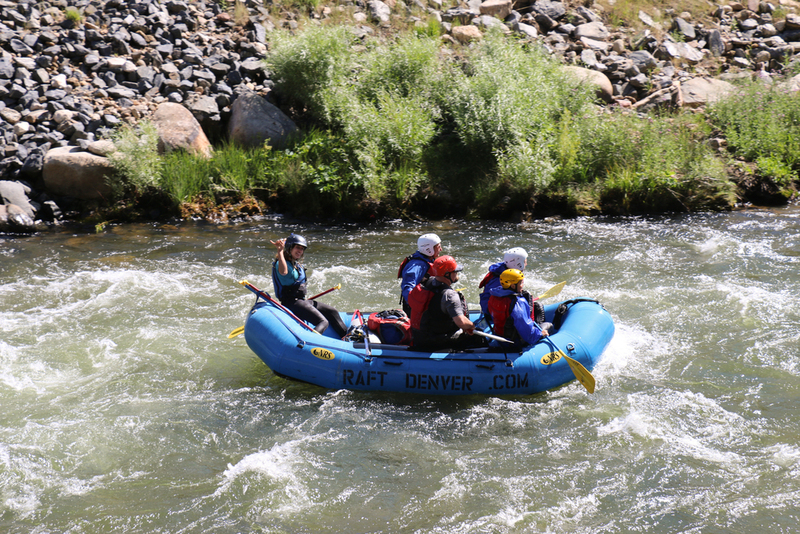 Always a welcome activity on a perfect, sunny, Colorado day. After the day's purchases were stowed, the SG caught up with the Team at Fox Farm Road. All but three of the riders, turned back towards Colorado Springs—putting in a 60 mile roundtrip. Bryan, Steve, Mike Rosser and Steve Pelican "headed for home" on Perry Park Road, a crazy mile on I-25, and on the frontage road into Castle Rock. It truly was the biggest ride with the best people! A fantastic day! With assistance from Monique McCoy of Children's Hospital Main Campus. Thank you.